The OWL+USB electricity monitor shows the user the amount of electricity they are using in real time (and it tells them how much that will cost them), as well as automatically storing daily records which can be broken down into two minute sections. 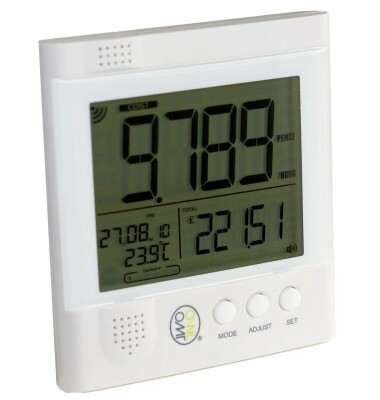 This allows the user to not only discover how much it costs to leave a light on, or how much you waste by filling the kettle with more water than needed, but also have a visual record of how the electricity usage spiked when you were in the shower, or what the boiler is doing while you are asleep! 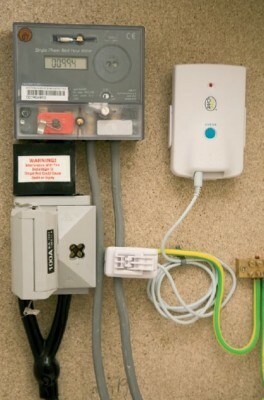 The process of setting up the energy monitor is very straight forward. When a LEG officer visits your home, they will have an OWL monitor ready to install. Access to your meter box will be required so that the transmitter can be connected to the main power cable entering your house. In the image to the right you can see a transmitter and clamp set up. The monitor itself can be located relatively freely throughout your home as long as it remains within range of the transmitter. On the screen, you will be able to see your current energy consumption, date, temperature and the total cost of the energy consumed during the monitoring programme. The monitoring will occur over the period of a month with a visit every two weeks for us to collect the data from the monitor. We will take the data, analyse it and produce a clear and understandable report covering the major contributors to your energy consumption and some suggestions towards reducing your overall energy use. Within the report you will see images similar to the one below, highlighting peak periods and interesting discoveries that may be of interest to you.